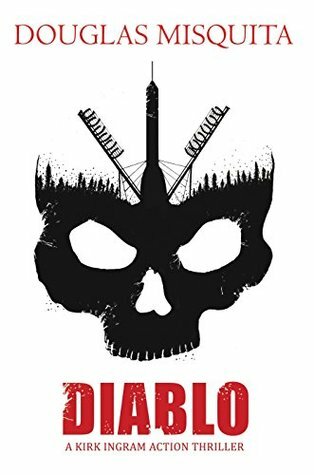 Diablo follows Agent Kirk Ingram from Haunted fame into another adventure, loaded with bloody fists, armored vehicles and artificial intelligence, in the midst of a very real-world immigrant crisis and political treachery. Navigating the twists and turns of Ingram's story the book also narrates a very intimate parallel arc of the struggles of a fleeing mother-son duo escaping a war torn nation with hopes of a better future, bearing inhumane afflictions along their journey . Peppered with futuristic bio technology and research, Diablo showcases another dimension of Douglas Misquita's writing capabilities and understanding on how it conforms into the socio-political landscape. Diablo's up-close and personal encounter with the tribulations and mistreatment of victims seeking refuge from war is commendable, both in its research and bringing awareness to their plight. Douglas Misquita has fine tuned his character sketches, spending more time on developing characters, making them relatable. The book harbors elaborate details, which at times seems to drag the narrative, but are a toast to the book's attention to detail, to which the author seems to take a gleeful pride in. Conversations between characters could do with a bit more energy and may seem a bit dry at times. The story telling needs polish in balancing a fast action thriller with the pace of political and interpersonal relationships. The book's dramatic final chapters were to me, the most interesting part of the book. It was the author's final punch showcasing his true potential, prognosticating his signature style in the action thriller genre. Elegantly brutal and calmly high-octane. A showdown which earned this review it's fourth star. Anyone who has been following Douglas Misquita as an author would have expectations of fast paced action, cinematic and research detail, with a multitude of characters weaving into the story line. With Diablo, Douglas Misquita goes further than before, giving us a peek into what may lie ahead in his literary future.